Reading the Bible in 90 days, four days into it and Genesis has been read in full. I love God's Holy Word. I believe it. But I have never memorized whole books of the Bible. I actually haven't memorized whole chapters since childhood. Why isn't that a habit, too? When I contemplate hiding God's Word in my heart, I sometimes think of people who don't have access to the written Word. Memorized Scripture is beautiful. Don't you love it when just the right verse pops into your mind? God knows our heart, our inmost being. I just now read a challenge to learn Colossians by memorizing two verses a week this year. That seems manageable, broken down that way. Would you like to join me? 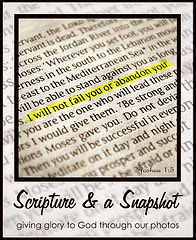 Ann Voskamp shared a commitment booklet you can download from her blog. I have another personal goal. I'm trying to lose 100 pounds before I turn 40. What if I fill my mouth with Scripture instead of with food?! I could probably meet both challenges that way.